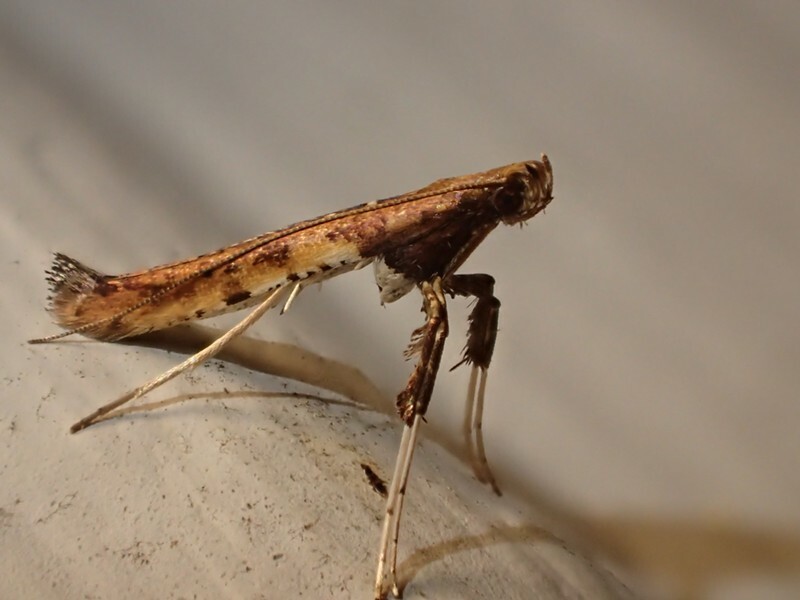 A moth from the family Gracillariidae strikes a mantis-like pose. There was one tiny critter I did not recognize at all. Its stance resembled a praying mantis about 8 millimeters long. I got out my little pocket camera and snapped a few closeup photos. By the time I had exhausted all angles and lighting combinations, it flew away. That it flew at all was a big clue. Insects only develop full sized wings and flight capability as adults. When I uploaded the images, I was more mystified than ever. Instead of it hiding its front pair of legs in a raptoral pose like a mantis, it held the first and second pair together. Close examination showed wings covered with scales, which immediately indicated it was a moth, but not like any moth I had seen before. So I posted it online. In less than a minute I got a tip that it was a moth of the family Gracillariidae. A new one to me. 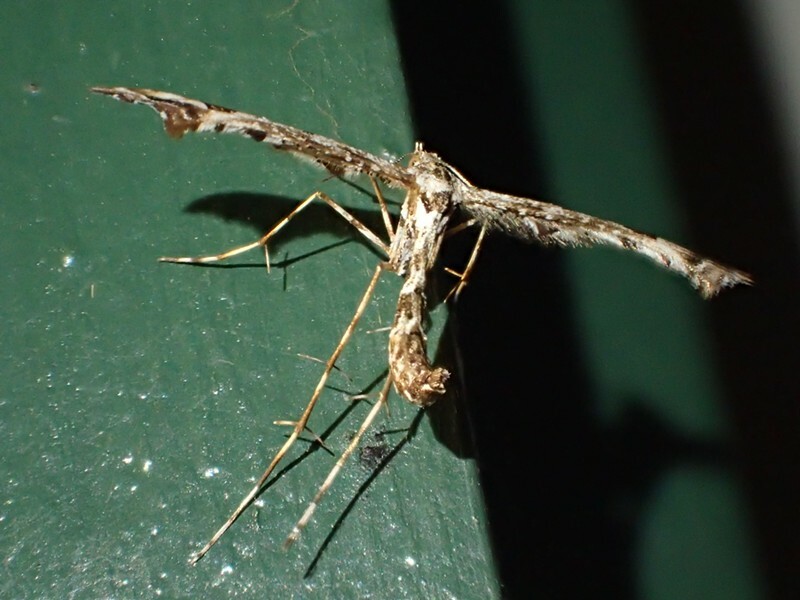 Twenty-plume moth spreads its fan-like wings. 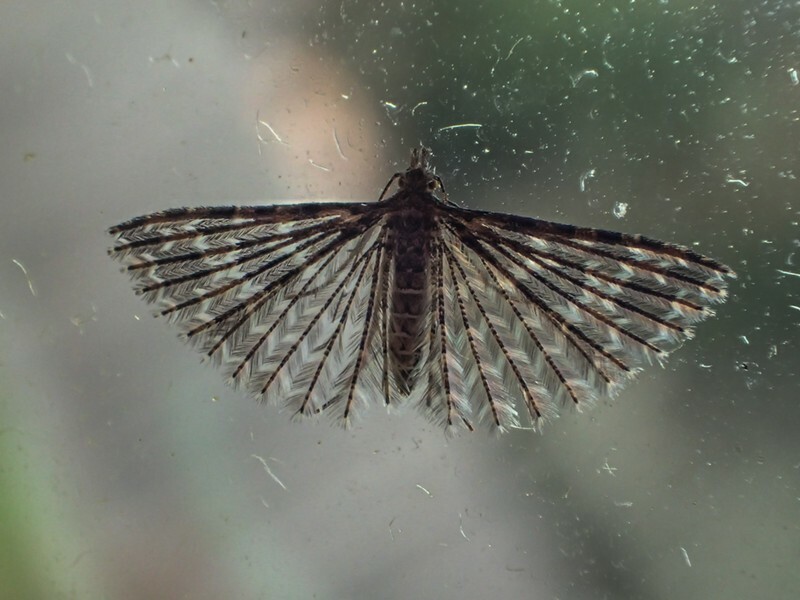 Today, looking out a window there was another tiny moth, this time with its wings spread. It looked as if they were folded like a fan. I snapped a few photos of that one before it flew away. On uploading the images it was a bit more remarkable than I had expected. Instead of wing membranes like other moths, this one had little bars with tiny filaments along them, like a bird's feather. It took me a little while to find, but this one is a 20-plume moth (Alucita hexadactyla).